A solar-powered cannabis dispensary called Emerald Pharms is housed within the grounds of the Real Goods Solar Living Center in Hopland, California. The sky is a soft blue as sunshine beams down on a row of photovoltaic solar panels framed in the line of sight by a geodesic dome filled with microgreens, a windmill that “can pump impressive amounts of water in light breezes” and a few picnic tables. Equipped with a map for a self-guided tour, the grounds of the Real Goods Solar Living Center in Hopland, California are expansive, but one sustainable component of the site is missing from the rendering — a solar-powered cannabis dispensary called Emerald Pharms. Still in its infancy, Emerald Pharms has only been open for a little more than six months and has yet to advertise. While its host site, the Solar Living Center boasts a barrage of roadside signage, the dispensary’s location isn’t clearly defined. It’s discovered only after a guide in the Real Goods retail store supplies vague directions as well as blue marbles that, she explains, are wishes and can be charged with additional power by the “blue fairy.” The blue fairy she’s referring to is Emerald Pharms’ General Manager Chelsea Lucich and while the time spent on the 12-acre demonstration farm has been perfectly enchanting thus far, entering Emerald Pharms is nothing short of pure magic. The dispensary, which is both paperless and run entirely by solar power, is stocked with organic, outdoor flower selections as well as an impressive assortment of edibles, topicals and tinctures. Emerald Pharms specializes in the medical applications of cannabidiol, more commonly known as CBD. The cannabinoid is being widely recognized for a wide range of medical applications and played a large role in the partnership that brought a cannabis dispensary to the Real Goods Solar Living Center. Schaeffer explains that cannabis has essentially always been intertwined with the solar company he started in 1978. As far as he knows, Real Goods sold the first photovoltaic lights in the world and — while the cost has since plummeted 99 percent — each 9-watt light was initially sold at $900, or $100 a watt. “[Cannabis growers] were the ones who bought the first photovoltaics because A, they were the only ones would could afford them and B, they needed them to live off grid,” he said. 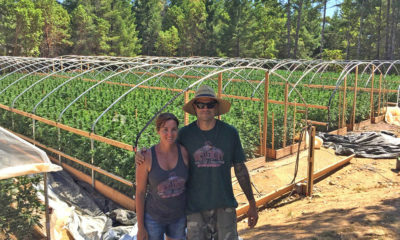 “As the growers supported the solar movement so did the solar panels support the growers because now they could be out living off grid and growing their cannabis out in the woods. And Schaeffer believes the relationship he’s struck with Project CBD, a non-profit educational group that’s served as a sort of consultant for Emerald Pharms, has shown great promise thus far. Sales at the Real Goods retail store are already up by margins of 30 to 50 percent. In addition to the dispensary, Project CBD is helping establish a native medicinal plant garden and marijuana museum at the Solar Living Center. In an interesting twist of fate, in 2001 Schaeffer sold his company to Gaiam, a company that focuses on yoga products, but stayed on as president. However, as of December 2014, he re-purchased the off-the-grid general store he started in Willits as a 29-year-old Berkeley graduate living at a commune and now retains sole ownership again. Part of that transition meant improving the site, which had fallen into a bit of disrepair, and developing new ideas to propel the company’s visions ever-forward. Once inside the space, the medicine is displayed on small wooden pedestals in three glass cases – one for flowers and concentrates, one for edibles and one for tinctures and topicals. The aesthetic of the space brings together natural wood elements alongside crystals, air plants and succulents. Since opening in October 2015, a large majority of visitors to the dispensary have been those seeking help with CBD treatment. Many are also older patients, who might not feel comfortable in a more restrictive dispensary setting. Large open windows facing the pond and gardens, along with an interior seating area and glasses of tea help the dispensary feel welcoming and open. On today’s visit Lucich is observed counseling and embracing an older woman with an oxygen tank on the sunlit patio. The complete vision for the dispensary, Schaeffer explains, is a holistic hub to promote the practices associated with sustainable cannabis cultivation. The Solar Living Center will celebrate 20 years this summer. Before departing the dispensary, Lucich charges the marbles with additional focus and provides instructions to make a wish that benefits the world. The final instructions are to cast them into the water feature serving as the land’s central point, a solar calendar.